Benji Rosenbloom is your average Joe on a plane journey minding his own business. However, his confidence in the safety of air travel is suddenly challenged when his plane crash lands on an island in the middle of nowhere and he finds himself to be the sole survivor. Initially disoriented, Benji soon befriends a young woman named Lola, one of a group of survivors of a shipwreck that occurred on the island some number of years prior who have now come to make the island their home and learned to live at peace with a group of primitive island natives. I S L A N D puts you in the shoes of Benji, who, with Lola's help, must learn to integrate with both the Shipwreck survivors and the natives, while in the meantime searching for some way home, avoiding a band of incompetent pirates attempting to bully the island's people, and discovering a series of bizarre truths about the island. I S L A N D is a point-and-click graphical adventure game in which the player must interact with people and objects in the game environment to solve a series of puzzles in order to progress the story. Similar games in the genre include the Monkey Island and Broken Sword series. The player is commonly free from any risk of 'dying' in the genre, an idea which is kept in I S L A N D.
You might be thinking that a plane crash on a bizarre island sounds somewhat like the TV series Lost. Inspiration for this project did indeed come partially from that series, but it really came from a large variety of fictional media based on a desert island setting, not just that show. Monkey Island, Treasure Island, and then some. 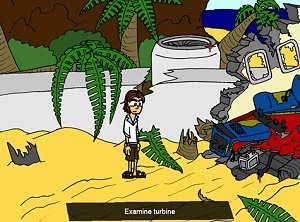 One of the main aims in making this game was to explore how a story about crash survivors on an island, which holds secrets, could develop without the supernatural elements present in Lost, while at the same time creating a satire of the desert island genre in general. I suppose you could think of it as Lost meets Monkey Island minus any supernatural elements. However, media which claims to be 'something' meets 'something else' usually ends up being pretty lame in my experience, so that being the case, don't think of I S L A N D in that way or I will slap you.